What if a woman is not a candidate for partial breast radiation therapy, but wants to minimize her side effects from radiation? Women with multiple tumors, larger tumors, or cancer in the lymph nodes, require traditional full-breast radiation therapy to eradicate the cancer. 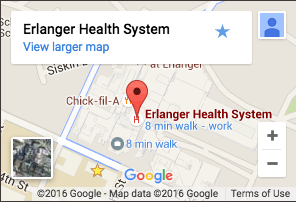 For these women, Erlanger offers treatment on a prone breast board which allows them to lay face-down during radiation treatment. The advantage to lying prone is that the woman’s breast falls away from her underlying chest wall. With the breast away from the body, radiation to the surrounding organs, the heart and lungs, is minimized. 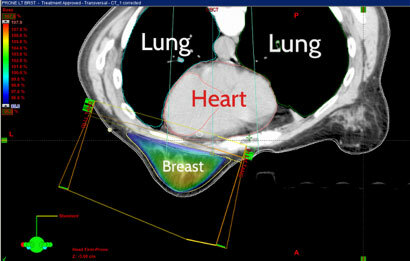 This actual treatment plan image shows how prone positioning directs radiation only on the breast, and away from the heart and lungs above. Clinical studies have shown that receiving radiation to the breast while lying in the prone position benefits women and delivers the same quality outcomes as the traditional supine position, where women lay flat on their back for radiation treatment.